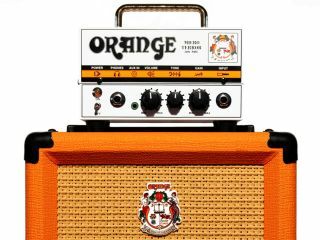 NAMM 2012: If imitation is the sincerest form of flattery, Orange's Tiny Terror can count itself one of the most admired amplifiers of the last decade. Now NAMM 2012 will see Orange Amplification add to its growing lunchbox amplifier ranks with a new Micro Terror and matching PPC108 cab alongside the already-announced Jim Root Terror head. "Orange Amplification launches at Winter NAMM the Micro Terror - its smallest Terror ever! Building on the winning recipe of the rest of the popular Terror series, the Micro Terror retains the beautiful unpretentious design, delivering a classic Orange sound way bigger than it looks, with a size and weight making it the most portable Terror yet! "The Micro Terror has a single 12AX7 pre-amp tube with 20 watts RMS of solid-state output. It is powered via a 15-volt DC supplier (international PSU included), features auxiliary input for MP3 player or CD, and can be plugged into to any cabinet with 4-ohm or greater handing (even a 4 x 12) and you will be ready to rock. "With a high tensile steel case is it built to the same rugged specifications as the other members of the Terror family and is incredibly compact and highly portable. This is a true Orange classic, with masses of vintage British character, clean crunch and full-on overdrive sounds. "Matching the new Micro Terror is the launch of the new PPC108 cab, ideal for building your own mini-terror stack and a perfect partner for the Micro Terror. The scaled down cab is available to purchase separately and its 8-inch speaker delivers a punchy tone and sound that has to heard to be believed. "Like all Orange speaker cabs it is built to last using extremely rugged construction and manufacturing techniques and uses our legendary basketweave tolex grill cloth, Orange crest and badge."